And a band that I’ve been wanting to see for almost 30 years can be marked off my list. 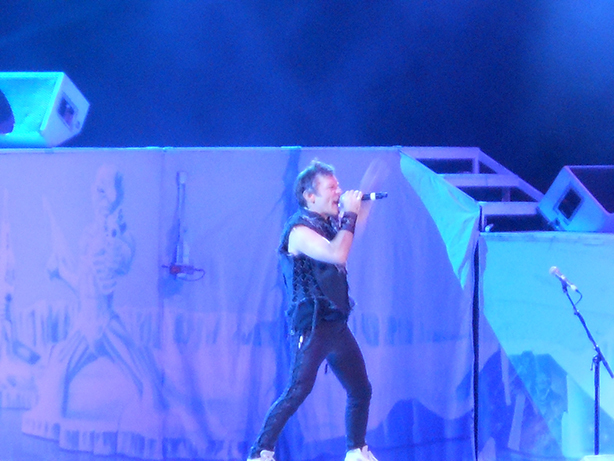 Iron Maiden played here in Utah – their first show in this state in 20 years – and I was excited to experience them live. 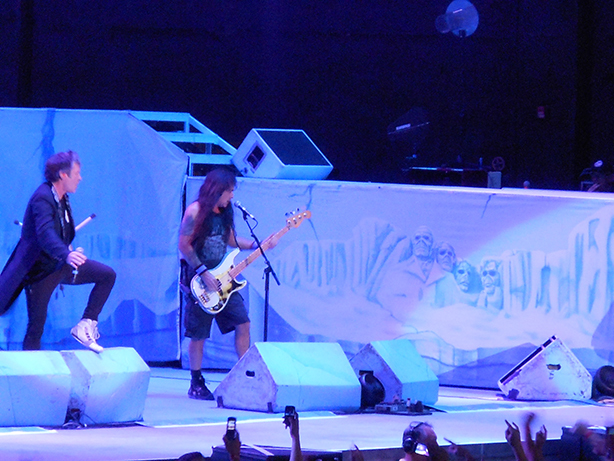 After a 45 min opening set by Coheed and Cambria [their best song was a cover – Black Sabbath’s “Heaven and Hell”], Iron Maiden took the stage for almost two hours of solid metal. The focus on this tour is the “Maiden England” tour, which was at the time of the “Seventh Son of a Seventh Son” album release. Which just so happens to be my favorite Iron Maiden album. So a perfect setting for a great show. And the band didn’t disappoint, with Bruce making light of Utah’s weak beer [as well as the large amount of weed that was being smoked at this show]. Adrian Smith, Dave Murray and Janick Gers are the triple guitar assault that works for this band, moving about the stage almost as much as Bruce did. The appearance of long time mascot Eddie got the crowd going about midway through their 17 song set, waving his sword at Steve Harris and Dave Murray. Nicko McBrain on drums kept the heavy beat throughout all of the songs and never let up. For being 53, Bruce managed to hit many of the mid to high range notes. His vocal range faltered a couple of times, but it was still better than some other aging rock vocalists that can’t even hit those high notes anymore. Let alone the fact that this lead singer was all over the stage, running non-stop in some parts of songs like “Run To The Hills” and “Number Of The Beast”. It wasn’t until “The Evil That Men Do” where Bruce missed his queue on the lyrics – skipping part of a verse. No worries from this Maiden fan as he took thi flub in stride. 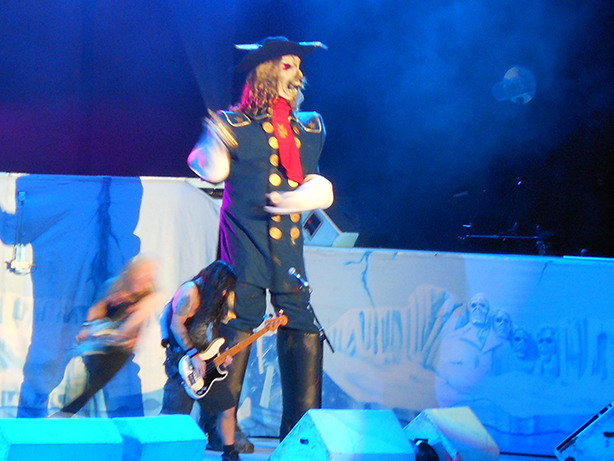 The stage set was elaborate in props, including a working replica of the Seventh Son character right from the album cover. 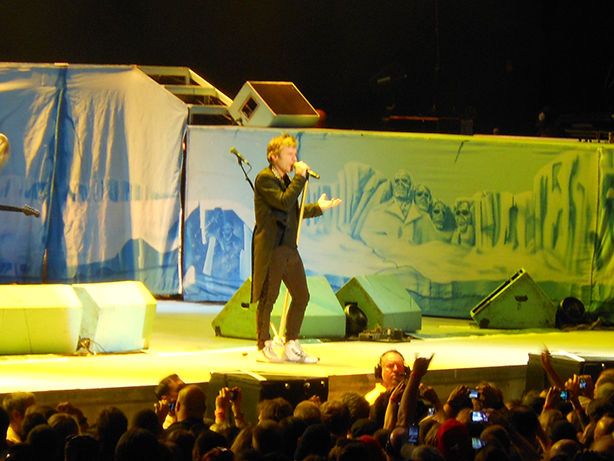 I was plenty pleased with this concert, as was my daughter – which was also her first time seeing Iron Maiden. If you can catch them on tour, do so. This band is still very strong after 30+ years and they play their songs as if no time has passed since their release. Up The Irons! Dude. 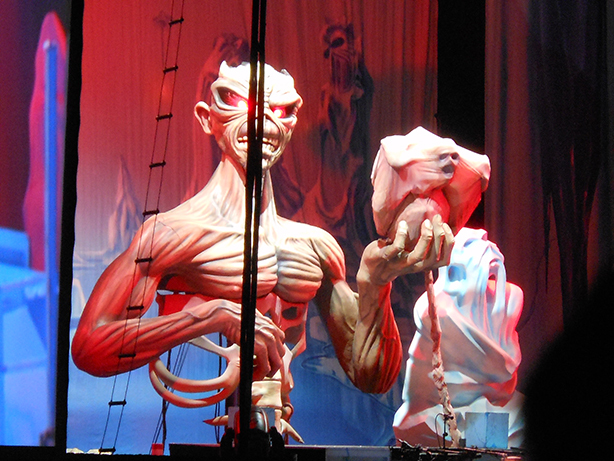 Maiden – one of my favorite concerts ever – twice. Glad you got to see them! Yes, I didn’t want to miss them at all, especially since they were minutes from my house. So glad I got to see them. Now to plan for a second time before they get too old. Nice review. It’s always interesting to see how the vocals hold up as the years go by. It’s a shame when the live vocal performance isn’t as good as it used to be (Hi Dave Gahan). Glad Bruce has still got it though. Thanks. And yes, Bruce was still good, but I wonder how many more tours he has left in him. They put on a killer show.